Mobile home for sale in Pierce County! 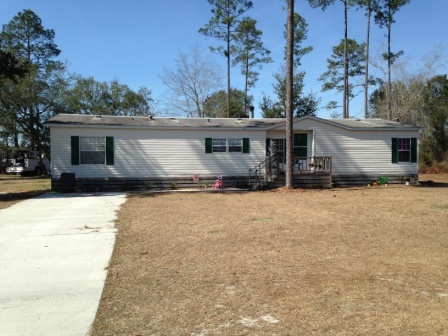 Home of Merit double wide 28 x 68 located at the back of Otter Creek Circle for lots of privacy. Features 3 bedrooms and 2 baths on 0.5 acres built in 1995. This property is currently tenant occupied bringing in a monthly income of $650. Purchase as a great rental investment or for your own home. You don't want to miss this opportunity, so call today to see. DIRECTIONS: Heading north on Hwy 84 about five miles north of Blackshear, turn right onto Owens Road. Travel about 1 miles and turn left into the Otter Creek Circle. Mobile home is located towards back on left, look for sign.